cup of coffee. 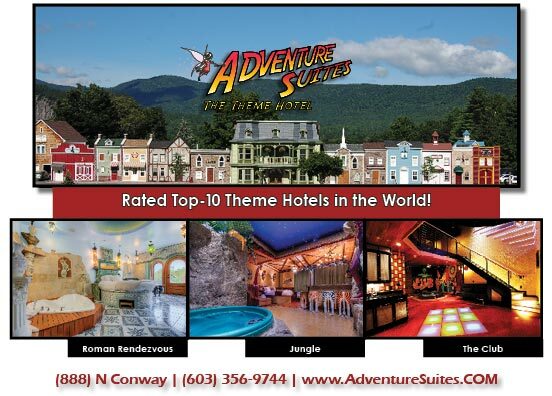 Created with a cup of fun, a pound of adventure, a bunch of love and a sprinkle of magic, Adventure Suites has a theme to suit everyone. Choose your adventure! Each suite includes a two person Jacuzzi or larger, free movies from our library, breakfast in our Diner where you can make your own waffles, toasted bagels, cereal and more, free internet access and WI-FI, billiards, use of our outdoor fire pit overlooking the mountains and evening “munchies” including popcorn and fresh baked cookies. Customizable packages can be added to your room for your special occasion. Be sure to visit our web site for the list of special occasion packages that we offer, virtual tours of the suites, rates and availability.